ISIS may be currently bogged down fighting to keep control of Mosul, but the brutal terror group has just proven that they still have time to perpetuate their barbaric propaganda, and their latest message to the West ranks as one of their most despicable. A chilling video released this morning by members of the Islamic State announced that they find the St. Louis arch unimpressive and have no wish to attack it. The disturbing footage shows a group of gun-wielding ISIS fighters expressing in no uncertain terms that the arch is safe from their terrorist network due to how unappealing and tedious it is. The men in the video then go on at length discussing how they would happily lose 10,000 men trying to blow up the Space Needle, but losing even one man at the Gateway Arch would be deeply shameful and a complete waste. 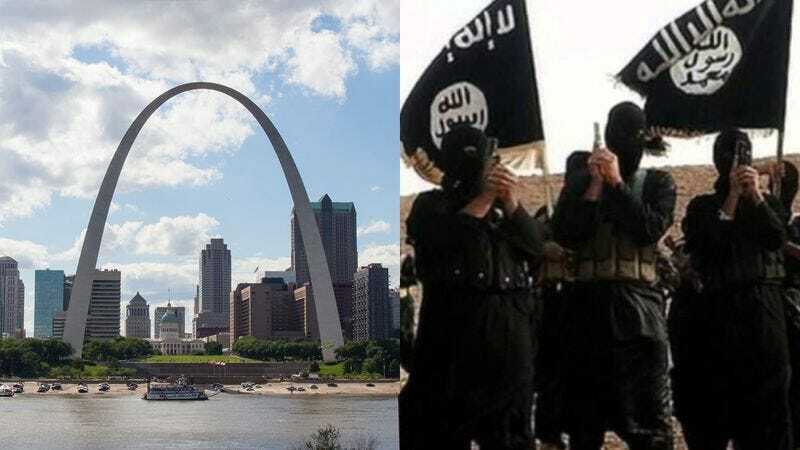 The city of St. Louis has been left reeling as residents struggle to come to terms with the fact that the terrorist organization has so chillingly left their arch far off a list of potential targets. In response, Mayor Francis Slay issued a press release this morning in order to reassure residents that the arch is “plenty interesting,” but concern caused by the video remains in the St. Louis metro area as residents look up at their arch, worrying how little ire it has stoked in the repugnant terror organization dead set on bringing the West to its knees. Enough is enough. Hopefully, the major defeats ISIS suffered over the summer only pick up momentum because this kind of savagery needs to stop. Now.